The classic cowboy look never goes out of style. and you don't have to be a cowboy to sport this Wrangler Men's Charcoal FR127CH Flame Resistant Western Work Shirt. Yes, it's perfect for you dudes who work on ranches and farms, and it's also a super shirt anyplace ... (see full details) (see specifications) #FR127CH. The classic cowboy look never goes out of style. and you don't have to be a cowboy to sport this Wrangler Men's Charcoal FR127CH Flame Resistant Western Work Shirt. Yes, it's perfect for you dudes who work on ranches and farms, and it's also a super shirt anyplace where the protection of flame-resistant workwear is important -- even at that backyard barbeque. Crafted in a 6.5-ounce lightweight 88% cotton and 12% nylon FR sateen, this FR shirt wears well, looks professional, and is flame-resistant. It meets the requirements of NFPA 2112 as well as NFPA 70E, ASTM 1506 and OSHA Rule 1910.269 standards. It's rated HRC2, ATPV 9.5 CAL/CM2. When flame-resistance is important, reach for a Wrangler FR shirt. This charcoal-grey work shirt features western styling with a snap front that makes it easy to put on and take off. Authentic western spade-shape front and back yokes provide a comfortable fit with room to move. The spread collar can be worn open or with the button at the neck fastened; add a tie when you want a dressier look. Two front spade pockets with flaps and snaps provide plenty of secure storage. There's even a convenient pencil slot on the left pocket. Both pockets feature Wrangler "W" stitching, and the left pocket features a Wrangler FR label. On the left sleeve, there is a safety orange label for high visibility. Long sleeves with 3-snap closures at the cuffs give you plenty of room to roll up the sleeves. Your new favorite work shirt, this Wrangler Men's Charcoal FR127CH Flame Resistant Western Work Shirt is available right here at Working Person's Store. 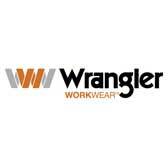 Wrangler Shirts: Men's Charcoal FR127CH Flame Resistant Western Work Shirt is being added to your cart.